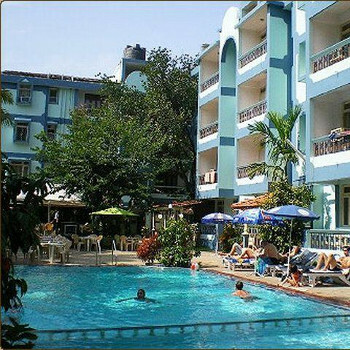 The Osborne Resort is set in a peaceful location, landscaped with palm and coconut trees framing the sun terraces. The hotel consists of adjoining complexes offering basic accommodation. Each complex has its own swimming pool and restaurant. Do not stay here. Most rooms where being sprayed to kill the bed bugs. They charge 100 rupees a day for Wi-Fi and the reception staff are rude. We had to leave the room at 11am but where not getting picked up till 10pm at night, so we had to leave or bags at reception and did not have a room all day. We will go back to Goa but never this hotel. Goa is a great place and very cheap place we got 103 rupees to the pound, we are going back next year but not to this hotel. Hotel tip: Best food is outside this hotel in a bar called zicos. Stayed at this hotel 4 times now and got to say that whilst we've enjoyed every holiday, the service has slipped badly - especially this last visit. Don't be put off staying here though as the location is good, the hotel has been clean on every visit (sheets & towels changed regularly) and there are plenty of restaurants and bars locally. Just be cautious about some of the staff. The majority of are ok - friendly and attentive - but there's a few who simply try to take advantage. 1) The boy that fills the fridge with drinks never has any change and always calls when the bill is a small total but one you'll probably round up and give him atip (e.g bill is 160 rupees and you give him 200). Always make sure you get the change otherwise he'll get increasingly worse as the holiday progresses. 2) Check the drinks you have out of the fridge and make sure the empties are taken away. One slipped extra empty bottle into my son's room and tried to charge saying my son had drunk it. If you are sure you haven't had the drink be firm and offer to go to the manager. It's amazing how quickly he backs down. 3) Keep a check on the drinks tab at the bar especially if there is a few of you and you have several drinks. Mistakes have been made with the number of drinks charged !! 4) Don't be surprised if the room boy tells you he is changing duties and won't be around at the end of your holiday - they're just trying to get a tip out of you. My husband and I visited this hotel many times and always found everyone very helpful. On the times my husband was ill the attention he received was exceptional one extra perk was Zicos restaurant next door The DSouza family are exceptional and very friendly we got to know them well over the years and watched their business expand we could never have met nicer people I miss them all since my husbands death and hope to return someday . Me and my partner arranged this holiday with a group booking of 18 all who stayed at the Osbourne. I wont bore you will what ifs and excellence just how I found the hotel and staff. Having stayed in this hotel on 7 previous occasions i was very disapointed this time around. We arrived at 5.30am we were informed our room would not be ready until 9am. The room we were eventually given was not the best we have been in on previous occasions. Reception staff very unhelpful they were not the most friendliest people i have met. The pool was dirty with frogs in it during the day. Waiters were only nice to be people who spent a lot of time in the hotel eating and drinking.The hotel overall could do with a revamp to improve it to the way it used to be. Very disapointed this time i think it's time to check out alternative hotels. This was our 2nd time at the osborne and once again i must say that the hotel fitted my needs very nicely. The one complaint i had the last time was the waiters pestering you to buy tickets for various theme nights at the hotel. But they must have listened to the complaints because this year each person recieved 3 tickets per week to attend the buffet dinners free off charge. (probably added to holiday cost !) But with no pestering it made for a more relaxing atmosphere. Never had breakfast but did attend 2 buffet nights which were adequate. My son joined us from another hotel on those nights and he had something from the menu and enjoyed very much. It certainly looked good. I stayed in phase 3 this time and as before the rooms were basic but clean enough with clean towels and bedding every day. Though some new towels are needed to be invested in ! Would certainly use this hotel again.